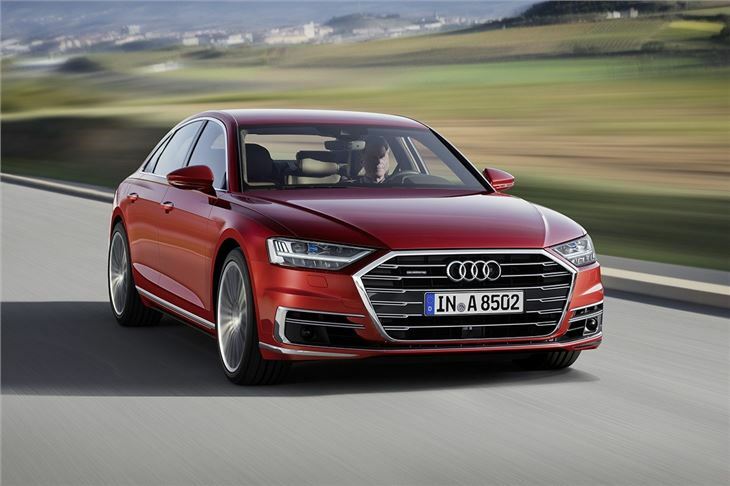 Audi may be a huge player on the UK’s premium car market stage yet, when it comes to the A8, their standard-bearing luxury barge, it’s the Mercedes S-Class which hogs the limelight. 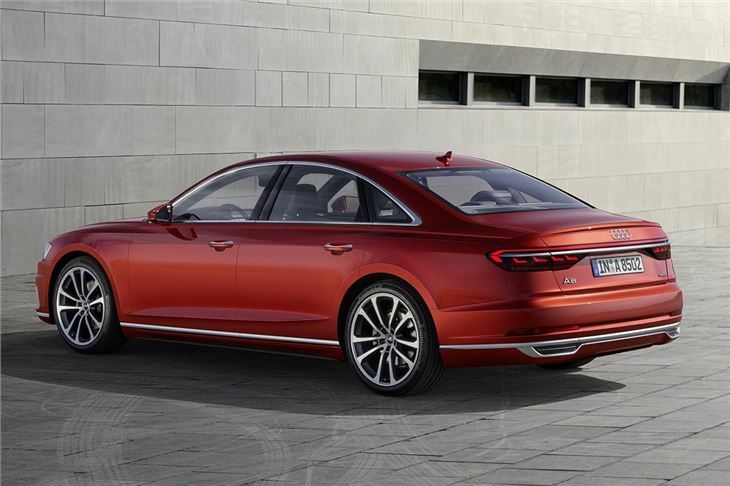 So the Ingolstadt brand is fighting back with a newer version of the A8. 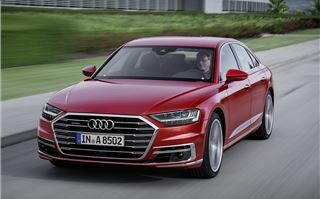 The focus of attention this time, though, is firmly on its 40-plus driver assistance aids which, they claim, will make this A8 the most technically advanced production car ever built. For sure this new tech is a two-fingered salute to Mercedes autonomous driving system and, for the first time, brings Level 3 autonomy to the well-heeled masses. Except, and this goes for the Mercedes-Benz software too, the full extent of its independence and functionality is still governed by legislation. Promised functions, such as remote parking via a smartphone, are still some way off, which means its main use remains below 37mph, where it will steer, brake and accelerate all for itself. First deliveries (expected early 2018) will see two extensively reengineered V6 turbo engines: a 3.0 TDI and 3.0 TFSI. 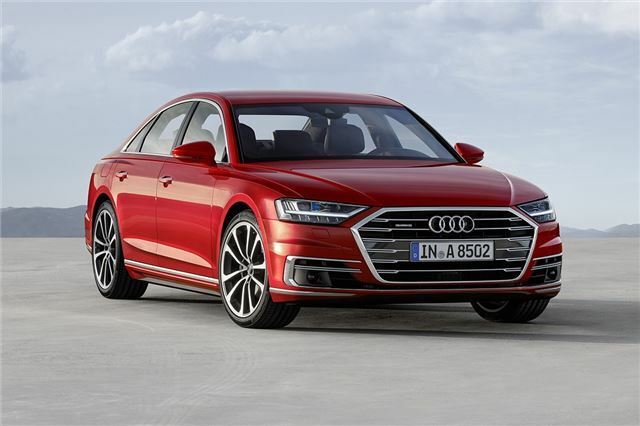 The diesel develops 286PS, and the petrol version 340PS (an eight-cylinder 4.0-litre TDI will follow slightly later, as will a 6.0-litre W12). 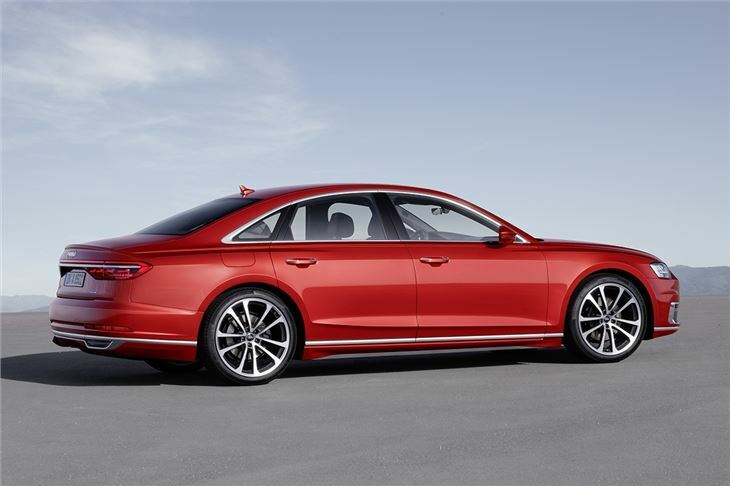 Each model receives an 8-speed auto gearbox and Quattro all-wheel drive system. 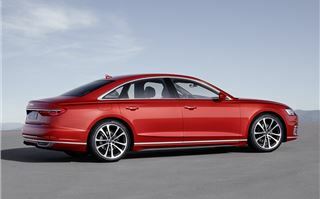 As with the outgoing A8, the 3.0-litre TDI is predicted to make up the bulk of sales. While this diesel manages to return 50.4mpg and emits 145g/km these efficiencies are still trumped by the BMW 730d xDrive and Merc S350d. That said, this 3.0 TDI is a very refined unit and let’s not forget it is being asked to tug two-tonnes of weight. The only real complaint is that there’s not the kick through the mid-range, which you’d expect from such a powerful diesel - so acceleration is never more than respectable. 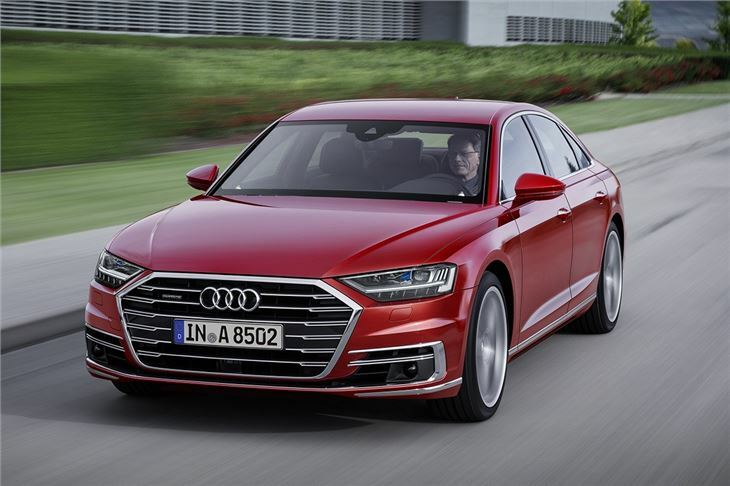 Then there’s the hoo-hah Audi are making over the A8’s 48V electrical mild hybrid system. Yes, it does allow for engine-off coasting and a longer gap between stop-start, but it’s no more than a novel fuel-saving device rather than a true hybrid. Our experience in Spain with the new A8 suggests librarian-approved vocals from the engine - it's that quiet. This, in part, is down to the active engine mounts that reduce diesel clatter. It’s supremely quiet as a motorway cruiser with minimal wind or road noise, but we’ll need to try it in the UK to be sure. There are some substantial pluses to the standard-fit adaptive air-suspension system. The difference between the selectable modes is pleasantly broad while maintaining decent body control and a useful degree of ride comfort. It’s unexpectedly to drive too, with sharp steering, reinforcing Audi’s commitment to real-driver involvement. The styling adopts the same design language already seen on the A4 and A5, which is moderately evolutionary rather than revolutionary. There is, however, now a greater definition and fluidity to its metalwork. Lower crease lines, cut crisply into either side of the bodywork, emphasises its 5.2 metre length (now 37mm longer). And even though it is half a centimetre narrower than the previous model, wraparound OLED headlights and the multiple horizontal lines on the front grille deliver the illusion of it being much wider than it actually is. The gains in length and height (13mm taller), plus a softer sweeping silhouette increases the overall sense of interior space and airiness. And it’s from here, sitting inside, the changes are most noticeable. 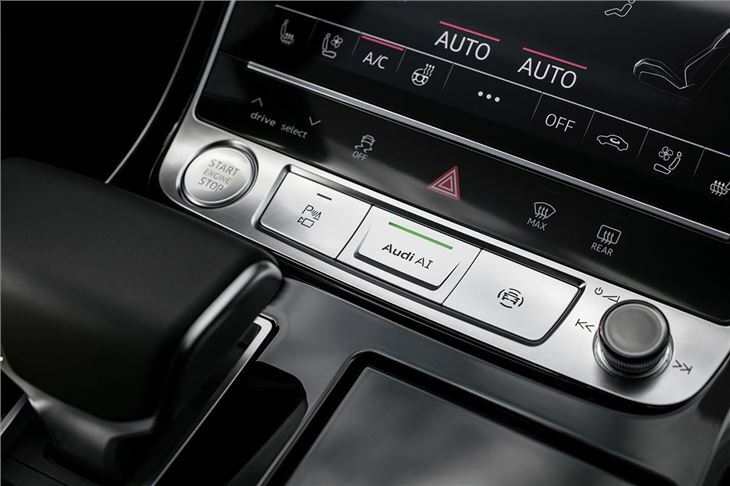 The dash design is neat and simple while high quality materials give an undeniable premium feel to the cabin - then again, you wouldn’t expect anything less from Audi. Surprisingly, it’s the integrated centrally-mounted 10.1-inch touchscreen which makes the A8 seem far more relevant than its German rivals. With haptic and acoustic feedback it serves as the main hub for things such as SatNav, audio and phone settings. Meanwhile, a secondary 8.6-inch display controls heating and ventilation - you only need watch the air vents theatrically disappear behind the facia to understand the levels of engineering and depths of build quality which has gone into producing this car. Back seat passengers are serenely cocooned in even more unassuming luxury - heated and massaging footrests are just one of the highlights. 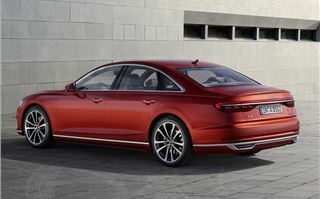 As with the previous model, this A8 will be available in both standard form and the long-wheelbase A8L. 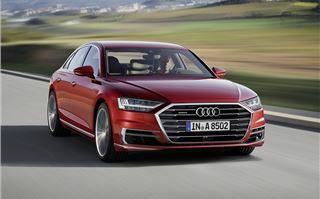 The debate over autonomous piloted driving – and this is just the tip of the iceberg – will rage on, but otherwise the A8’s cutting-edge tech integration is amazingly intuitive. And despite a few chinks in its armour, as a total package this A8 has astonishingly wide breadth, able to delight both driver and passengers alike.